As mentioned below with only 4 weeks to go until we walk the marathon, and with training being on hold for a while, I need to try my hardest to lose extra pounds sensibly (and stay strong!) for the event. I started walking again yesterday and although my foot still hurts this morning, it’s only annoying and not oww, oww so I will carry on training but stop if anything appears to be getting worse. So I had lost a small amount of weight this week (very small) and I weighed in this morning at 272.8 lbs (just under 19st 5 lbs or 123.74kg). Total weight loss since I ballooned again (310 lbs) is now 37.2 lbs ( nearly 2.5 stone or 16.9 kg ). This week I will update this page on a daily basis showing what I am eating on ration with a rough calorific value for food and exercise next to it. 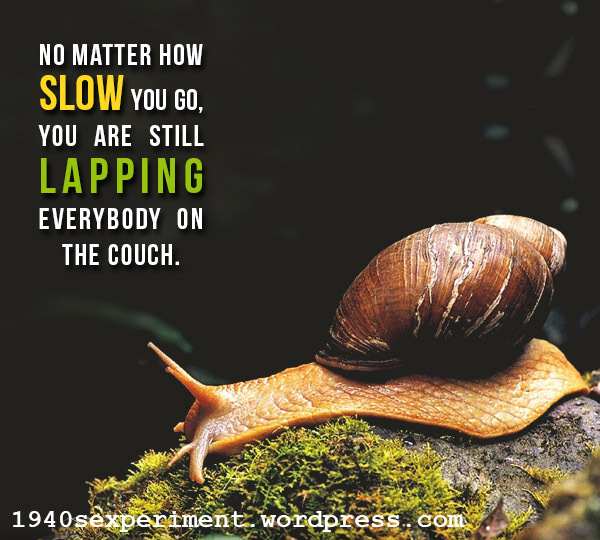 I’ve just checked in to your blog and *must* comment on the snail picture – I laughed aloud! Gorgeous! – before I start reading and catching up from when I last looked in. Back to reading!